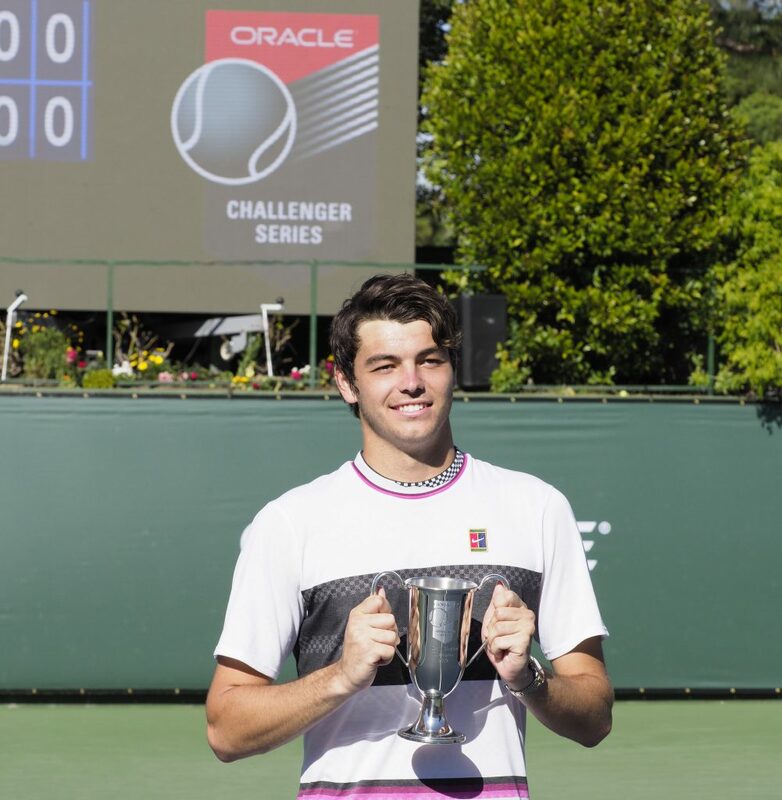 Taylor Fritz earned the top title in the Oracle Challenger Series finals at the Newport Beach Tennis Club on Sunday. 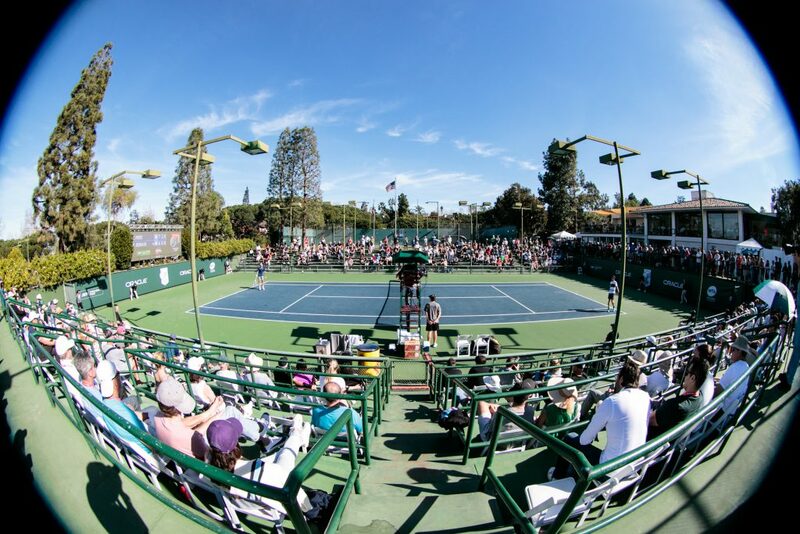 The Newport Beach Tennis Club was the place to be last weekend when the club hosted both the finals of the Oracle Challenger Series and the Oracle Champions Cup. It was Americans versus Canadians in the singles finals of the series on Sunday. This victory places Fritz in a career high rank at No. 40 worldwide. His win puts him at the top of the Road to Indian Wells leaderboard, next to Oracle Challenger Series Houston champion Bradley Klahn. 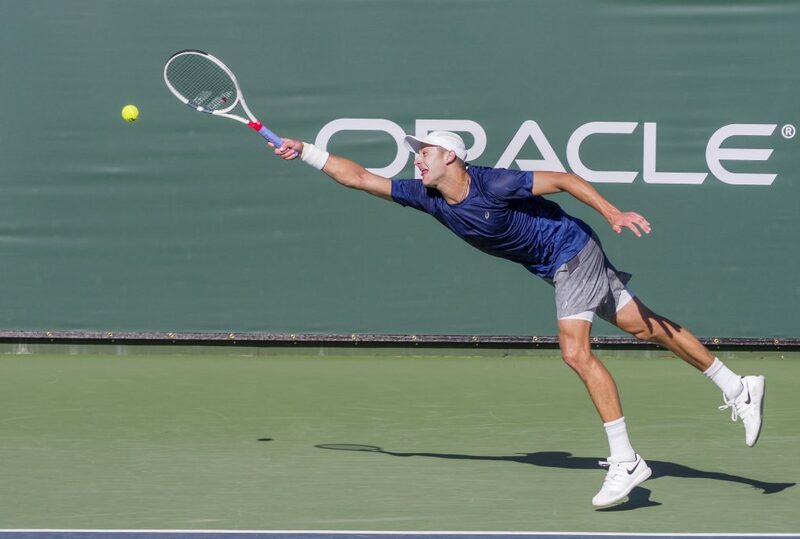 However, both Fritz and Klahn already earned spots at the BNP Paribas Open based on their rankings, leaving the coveted Oracle wild card up for grabs. The Challenger Series continues next month in Indian Wells. On the women’s side, Canadian Bianca Andreescu came out on top. She lost the first set 6-love, but came back to defeat American Jessica Pegula. 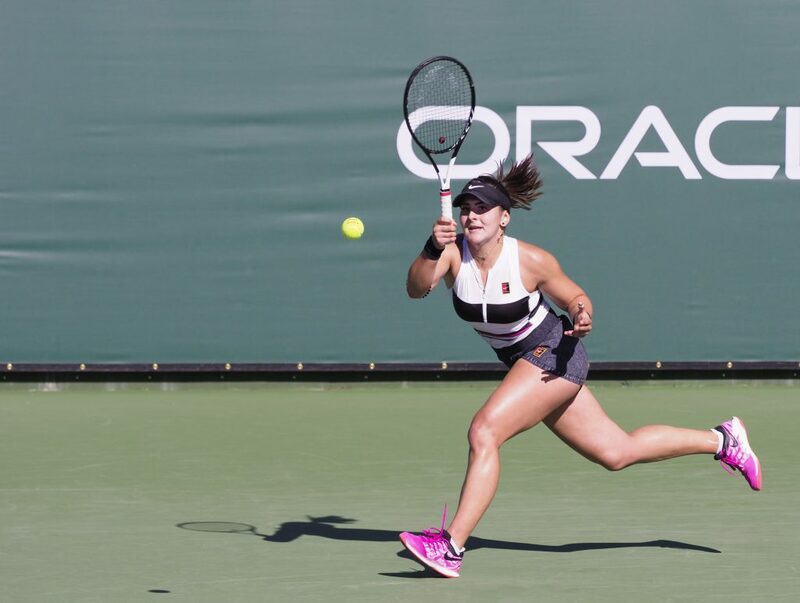 Canadian Bianca Andreescu won the Oracle series women’s singles title on Sunday, beating out Jessica Pegula. 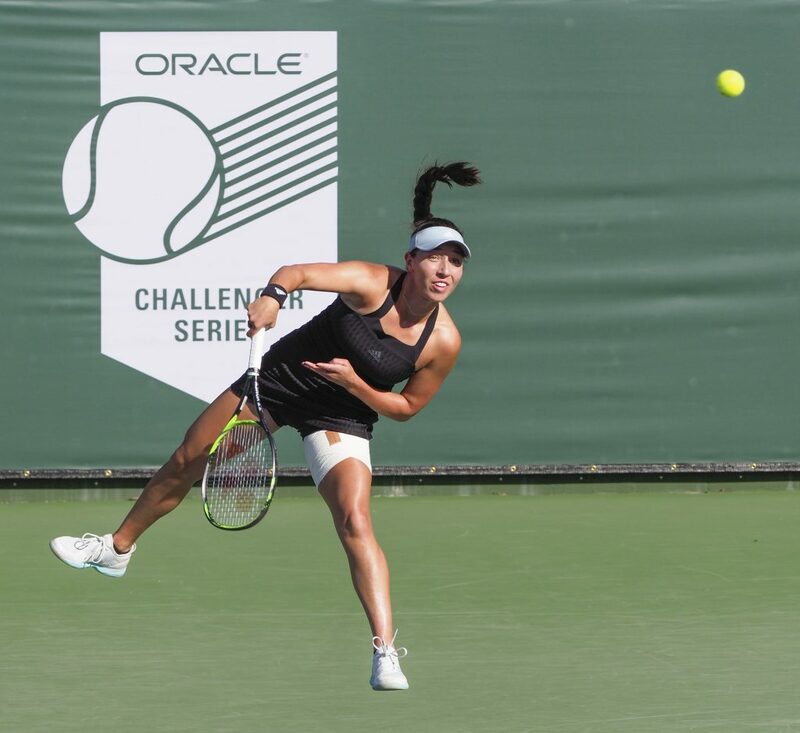 Andreescu broke her opponent early in the second set and managed to force a third set, Oracle officials explain in a press release announcing the win on Sunday. “The momentum really started to shift [in the third set] when I broke her at 2-all and went up to 3-2 because then I was serving, and got that 4-2 lead which made a big difference,” Andreescu said in the prepared statement. With the crowd behind her, Andreescu broke Pegula once again, and served to close out the final set 6-2. The win pushes Andreescu up to a career high rank of No. 68 worldwide. With the points Pegula earned in Newport Beach and previously in Houston, she now sits second on the Road to Indian Wells leaderboard, just one point behind Houston finalist, fellow American Lauren Davis. Americans were also successful in the men’s doubles final match, with Robert Galloway and Nathaniel Lammons beating out Romain Arneodo of Monaco and Andrei Vasilevski of Belarus, 7-5, 7-6. Americans also won in the women’s doubles division as Hayley Carter and Ena Shibahara took the title over Taylor Townsend of the U.S. and Yanina Wickmayer of Belgium, 6-3, 7-6. 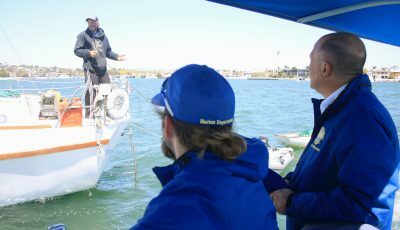 The Eastbluff club also hosted the Oracle Champions Cup, an Invesco Series QQQ event, on Saturday. 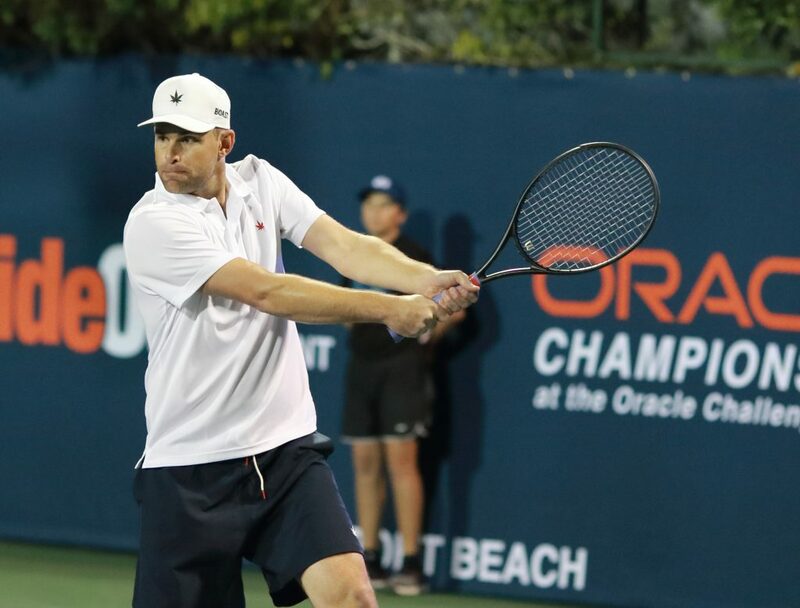 The one-night event was part of the competitive tennis circuit featuring “legendary tennis icons and world-renowned champions,” Oracle officials describe on the series website. 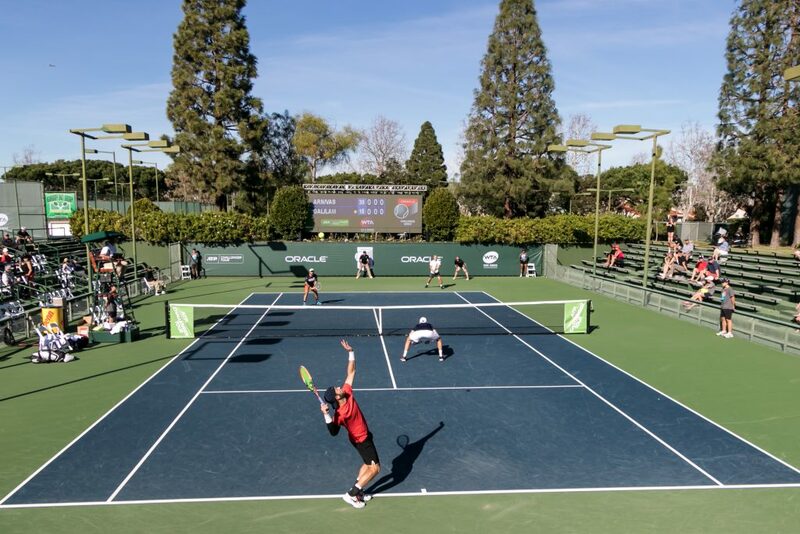 Oracle series men’s doubles final match on Sunday, with Robert Galloway and Nathaniel Lammons beating out Romain Arneodo and Andrei Vasilevski. 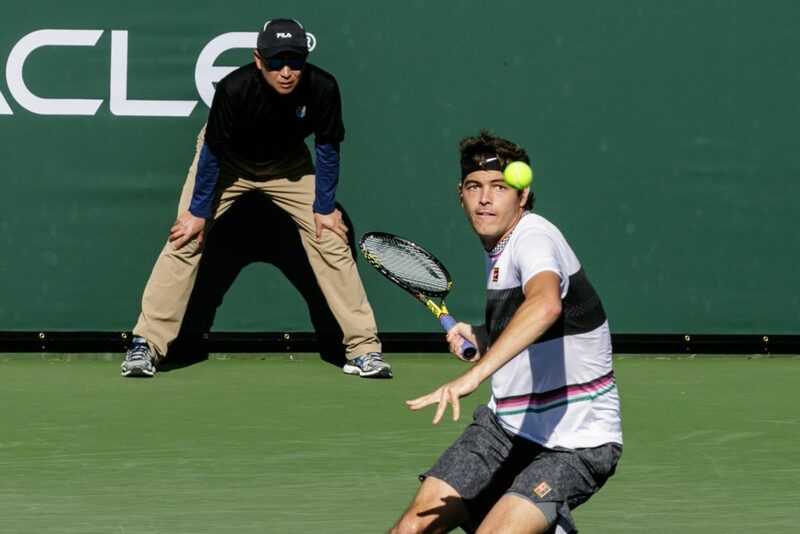 The Cup event finished with Tommy Haas kicking off the 2019 Invesco circuit Saturday the same way he started his debut season last year — with a title, Invesco officials wrote in a press release shared on Sunday. 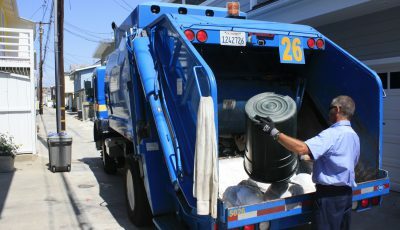 Haas, an Olympian and former world No. 2, defeated 2003 U.S. Open champion Andy Roddick 7-6 (2) in the one-set championship match to win the Cup in front of buzzing standing-room-only crowd, officials wrote in the announcement. Haas and Roddick each held serve four times before Haas broke serve to take a 5-4 lead, the press release explains. He was unable to serve out the match in the next game, surrendering his service game for 5-5. The two then each held serve again setting up the tiebreaker, where Haas was able to bear down against Roddick’s rocket serves and forehands. The Champions Cup event also had two one-set semifinals earlier in the day. En route to the Cup, Haas beat newly-named U.S. Davis Cup captain Mardy Fish in the first semifinal while Roddick beat former U.S. Davis Cup teammate James Blake. For more information, visit oraclechallengerseries.com and invescoseries.com. 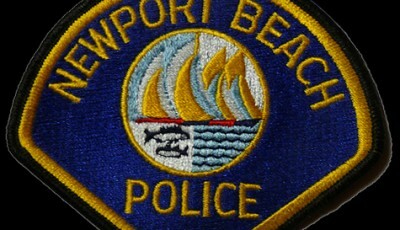 Tommy Haas won the Oracle Champions Cup, beating out Andy Roddick for the title, at the Newport Beach Tennis Club on Saturday. Andy Roddick during the Oracle Champions Cup on Saturday. 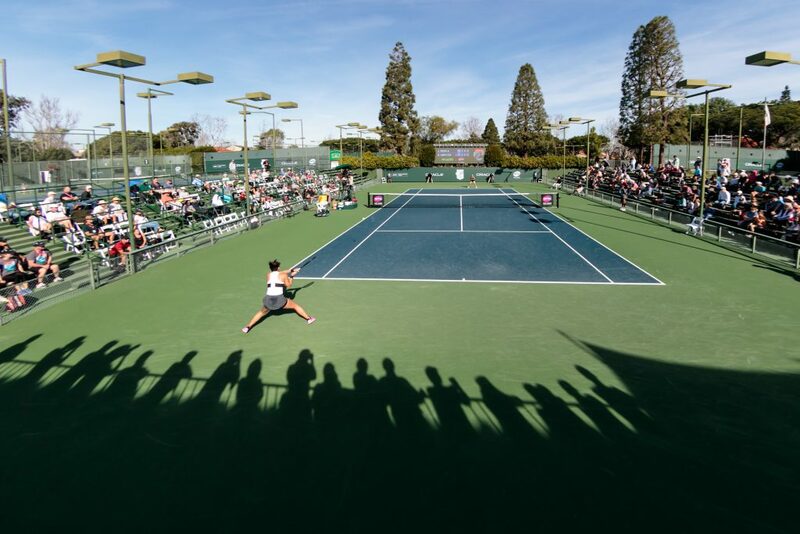 An excited crowd watches the Oracle Challenger Series men’s singles final match between Taylor Fritz and Brayden Schnur on Sunday. Brayden Schnur reaches during the men’s singles final match against Taylor Fritz on Sunday. Taylor Fritz poses for photos with his trophy for winning the Oracle Challenger Series finals at the Newport Beach Tennis Club on Sunday. Jessica Pegula during the Oracle series women’s singles finals on Sunday. 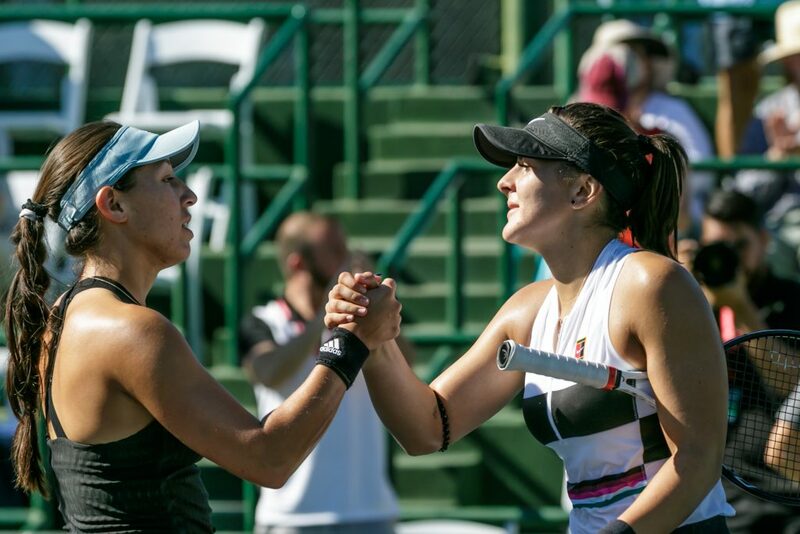 Canadian Bianca Andreescu (right) shakes hands with Jessica Pegula during their finals match on Sunday. 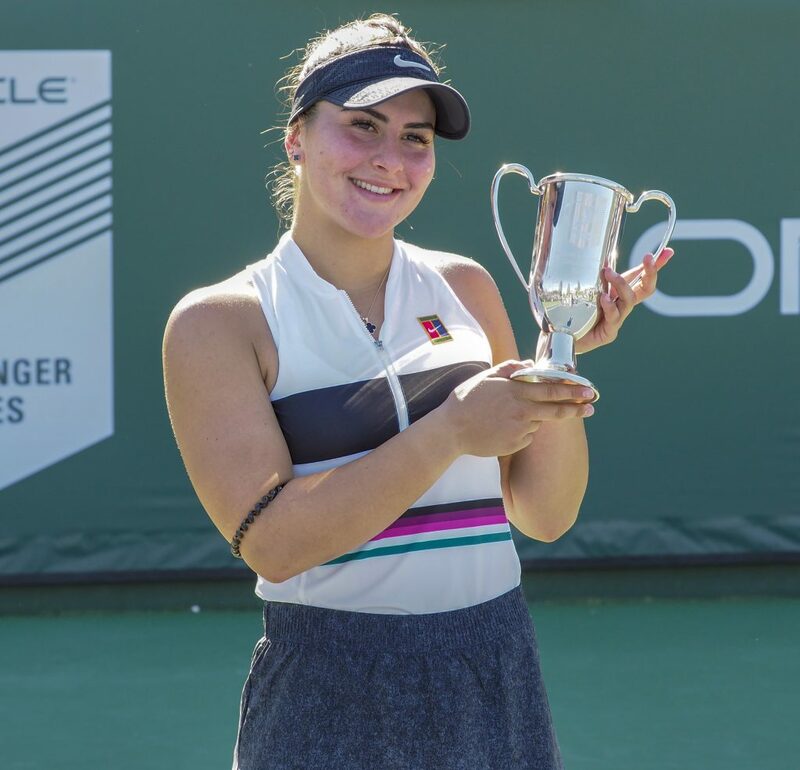 Canadian Bianca Andreescu poses for photos with her trophy after winning the Oracle series women’s singles title on Sunday. Oracle series women’s finals match on Sunday between Bianca Andreescu (foreground) and Jessica-Pegula.